"Johnny and Ann want to transform a 19th Century stables and pickers cottages, in the wine region of McLaren Vale, into their new home. 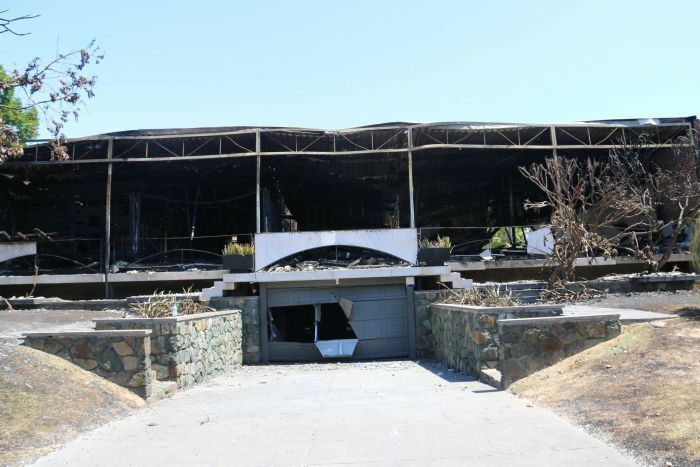 With a Christmas deadline, the pressure is on to restore the derelict buildings." John and Ann Baker are retired mathematicians. There might have been one "they crunched the numbers" in the show, but the lost punning opportunities make it clear they need some new writers. Stuart Harrison sounds like he writes his own lines as well, or makes them up on the spot, but he is nothing like Kevin McLeod's erudite mix of aesthetic prose and pop psychology. He sounds like he is trying, but apart from a strained attempt to instill drama by raising the usual specters of time, money, weather and council heritage regulators, he doesn't add much to the story. Mind, he does take credit for the discovering a view and the black-painted beams. 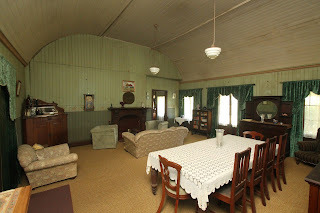 The restoration is a stables and cottage, opposite the Tatachilla Winery, which was established by a prominent local entrepreneur John George Kelly, who was the son of Dr. Alexander Charles Kelly, "renowned pioneer of viticulture in Australia". The original property took up one of the standard square mile sections in the Tatachilla distract of McLaren Vale South Australia. 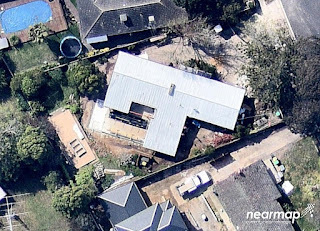 Later subdivision and collapse of a former winery company has left the stables and cottage on a smallish block. "The English exporting firm Stephen Smith and Company purchased the winery in 1911 and built the cellar block which was completed by 1913. The number of horses needed to work such a large area of vineyard necessitated the large stable and shed complex which included a stallion house for isolating individual horses." Elsewhere we discover it was only in 1903 that Kelly constructed a galvanised iron winery on the property. There are scattered remnants of the once extensive complex - with the stables and cottages possibly visible on the right of these photos. although the stables might be missing. Without being specific about construction date there are references to the large number of horses in the early 20th century and the vet who treated them, the families occupying the cottages in the 1920s and 30s, and the "up to twenty-five men [who] could be accommodated in bunk-house conditions". The wider context is quite interesting, with the managers house also surviing along with a bunch of 20th century production buildings. So, from what information is available, and looking at the buildings, (and in particular the light weight timber roof framing that gets Harrison all in a tiz), they look early 20th century, so the 1855 etc. dates are probably just imagination. This view suggests the stables might even be 1920s. The heritage listing says the "external form, materials and detailing...should be retained and conserved as required. Any adaptation which is undertaken of the buildings to adapt them to new uses should ensure to retain as much original fabric as possible"
The Bakers say they wanted to preserve their historic integrity, and they will try to keep as much as they can. So far so good. When we come to site, in what seems never ending scenic vineyard introduction and establishment shots, the cottages have already been de-roofed, gutted and lean-tos stripped away. The stables are mostly intact, although the stalls are long gone. It looks like someone has already had a go at doing something, but didn't get very far. So the works commence. The next time Harrison arrives, he has missed most of the restoration part at the cottages worksite. The cottages have new concrete floors, new framing is up. Steel roof is on, and the chimneys look like they have been repointed. From here on it is going to be fit-out and selecting lighting and bathroom fittings. Someone decided the new external walls would be corrugated iron, but we never learn who or why, or if the missing bits were cgi originally or not. The Heritage Study shows what it was like, so it might have been nice to give some acknowledgement both to the recording of heritage values, and the benefit of following research and conservation principles to come up with a meaningful restoration. The reddish brown trim starts to appear, looks nice, but was this based on some existing fragment, or a personal taste? We are not told. There is a proud announcement that the stable bricks might be sandblasted, but Stuart the architect, who should know better, keeps mum. The brick floor that they loved so much is ripped up and concrete poured around all the new drains and pipes. This appears to be about damp and cost, but it is not explained very well. A new floating timber floor is put on top, so why did the bricks need ripping up? A nice National Trust lady takes them to a quarry to show how to use water and soda to clean slate, and the slate floor in the cottage appears restored sometime later, but no idea if it was lifted and relaid to deal with the same damp problems the bricks were sacrificed for. They all head off to the nearby Shingleback Winery to get inspiration. This one has brick and slate floors, rusty roofing iron exposed inside, and a rustic shed aesthetic, but still made into liveable spaces. So by the end, what are we left with? The cottages are reclad, painted and fitted out with mod-cons (Harrison hates the string of colour-change LED's that are really one of the few personal touches). At least the trusses are one surviving shabby chic element. The stables has a new roof, although the trusses again stay in view. The rest is art gallery white plasterboard and floating polished timber floors with 'mini orb' ceiling lining . All very up-to-date minimalist, but with some rustic recycled industrial objet d'art light fittings made out of bits form the farm to give it a heritagey feel. The big sliding doors are gone, they copied the trick of pulling out every second louver to let some more light in, and there is a raised recycled brick thing in the middle to reference the sacrificed stable floor. One 'feature wall' has been left rustic. I spied a scarf joint in the trusses that Chris from Episode 4 would have loved. Among all the interior decoration shots though, the main view of the building that the heritage people said they had to preserve is hardly noticed. I see ABC iview has the program listed under 'lifestyle' now - sure it was a 'documentary' a couple of weeks ago. The restoration label is again barely earned on this project. The cottages are now 'luxury accommodation', which opened in 2017 with a bit of heritage PR: "Gone are the chaff or straw mattresses replaced with luxurious king-size beds, but we do provide the makings for a hearty breakfast together with a local wine and cheese platter on arrival"
The last unanswered question is who is going to fix up the Tatachilla winery across the road. "Snapping up a piece of local history and preserving it appealed to Jan and her daughter Annie. Joined by Annie's carpenter partner, Chris, they tackle the daunting task of making the 1840s homestead a new family home." At last, real restoration on Restoration Australia - see it here on iview. Chris is doing up the old Rosenthal Homestead for his mother-in-law. She is the publican at the Killarney hotel (30k out of Warwick) and is looking forward to retirement. Out the back is the 'Squatters cottage' that Chris will fix up for himself and Annie. The property was put up for sale by the Mulcahy family, who had held it since 1919. 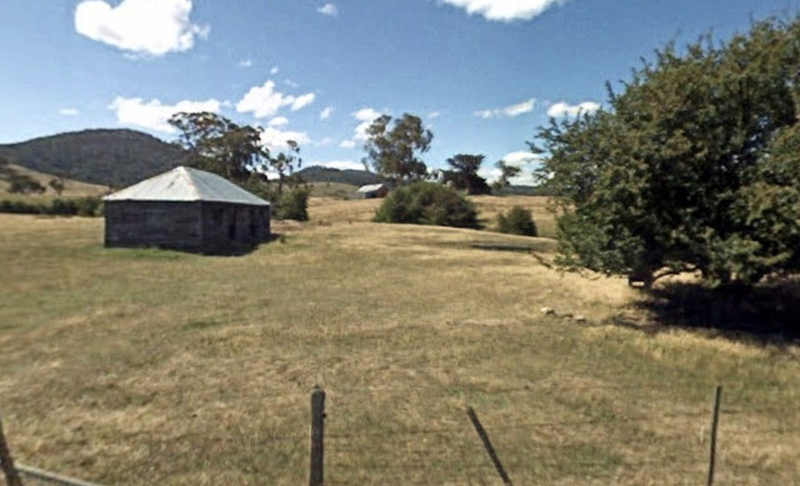 "Jim and Diane Mulcahy said they wanted new tenants to take care of the heritage-listed homestead...and the Moirs said they would do just that." Its just outside the town of Warwick in southeast Queensland. 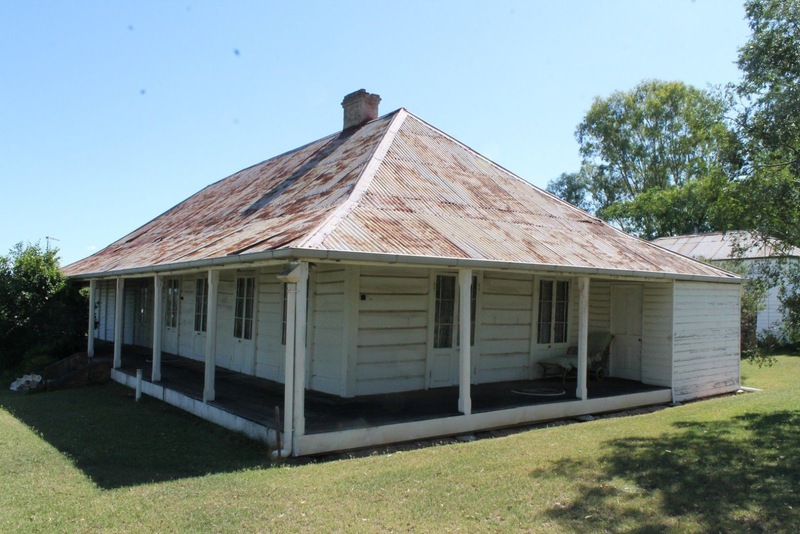 Host, Stuart Harrison, has worked out the homestead was probably built between 1845 and 1849 by Frederick John Henry Bracker (c1798-1870), wool-grower, born at Mecklenburg, Germany, arrived New South Wales 1829 with Prince Esterhazy's Silesian flock for the Aberdeen Co. for whom he managed the Rosenthal Run. I suspect this was in the book Jan was holding. 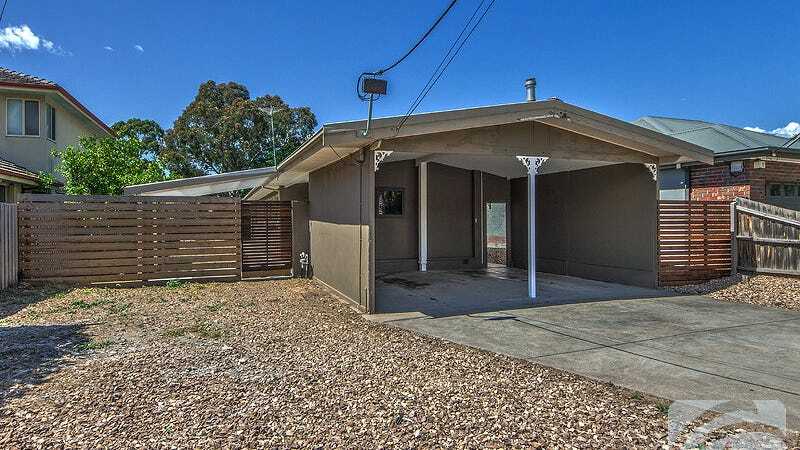 Harrison also refers to the house as a 'Queenslander' but I don't think it fits the category since it is siting on the ground without the elevation that characterises this style of bungalow. Perhaps if it were elevated, it might not have suffered the supposed flood damage, or such extensive termite attack. He is supposed to have brought the first stud merino ram to the Darling Downs. 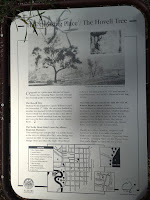 The place was known as 'Fred the German's Creek'. After Bracker, John Deuchar (1822-1872) from Aberdeen, ran Rosenthal as well as the nearby Glengallan. He is also credited with having the first two thoroughbred merino rams on the Darling Downs as well as Lord Raglan, the first imported Shorthorn bull to reach the Downs. 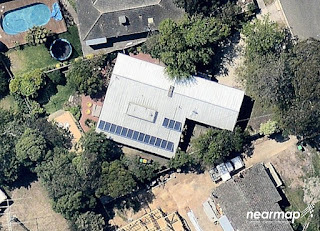 Rosenthal was to be split up into 20 hectare lots, but the Moirs wanted a bigger property: "We were scared we might lose out on the homestead if they moved to auction it off in the different parcels so we bought it all together," So they got the homestead block and surrounding paddocks along with town water, underground power, 70,000 litres rainwater, 55,000 litres creek water storage, outbuildings, car and tractor accommodation, meat house, poultry pens, stable, brick bails, cattle yards and more - for $845,000. The real-estate agent reckoned the property would "...suit a wide range of buyers, including historians, developers, and lifestyle buyers." Perhaps they had a premonition that it would attract a potential heritage restoration reality TV show participant. "We have a lot of experience doing up old properties," "We don't want to change the look of the place we'd just be looking after it and doing what needs to be done." This sounds like it could be a paraphrase of the Burra Charter's "do as little as possible and as much as necessary" as well as demonstrating the methods outlined in James Semple Kerr’s The Conservation Plan. - ensure that the skills and knowledge necessary for the job are available - Chris seems to have these in abundance, second understand all aspects of the property - Mrs Moir seems to know the history well (and is polite enough not to show up the host), understand the significance, and the risks - Chris starts by stabilising the foundations and securing the roof to make it weather proof. All excellent conservation actions. There is an element of drama - Chris carefully pulls the frames back into square and jacks up the floors. Dramatic music suggests something will go bad. Will he be able to manage or will he crumble under pressure - but he doesn't crack - there is lots of cracking and groaning but its lots of good noises as everything shifts back into place. The floors are leveled up "fairly close". Chris is cool about it. The white and damage is worse than he thought, but the challenge just encourages him. Early wall paper exposed in the fix up, gives a date or around 1844-5. Chris hunts out the sandstone used for mortar in the chimney brickwork and experiments with mixes. He is using traditional skills and materials. 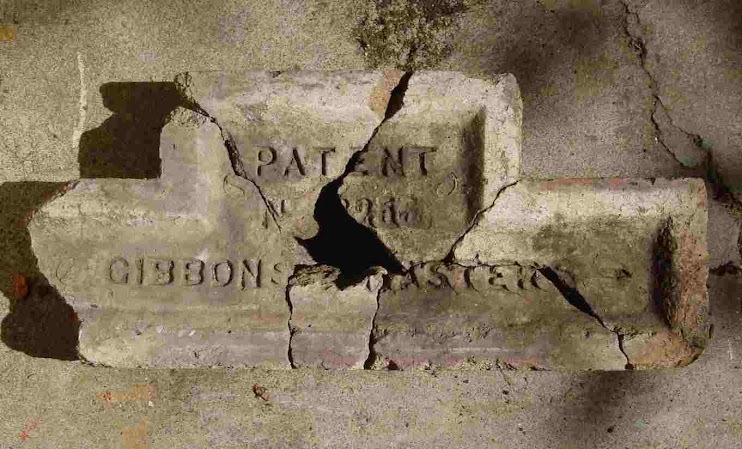 We don't learn if it was lime putty or Portland cement he used, but the signs are the correct historical mix was used. He joins timbers with complex scarf joints - maybe it wasn't essential, but I get the impression he did it that way because he could. The fabric of the building is respected, both as a source for historical authenticity and a place of cultural significance. The Conservation Plan says we should compile evidence and use this as the basis for conserving and recovering the cultural significance of the place.- Chris finds the mortises from the original wall studs to relocate the internal walls. Jan points out the remnant red paint on the roof and has a handle on the history of the place. Fragments of wall paper reveal the original finishes and sequence of decoration and they plan to leave some on display. The doors, windows and locks are extracted. They reveal their history in the dings and knocks. The original glass is re-puttied in with linseed oil to give it "...the really good proper look to be exactly the same as when it was first done." The metalwork is soaked in molasses for months to get rid of rust. New timbers are treated with a mix of vinegar and steel wool to age them. 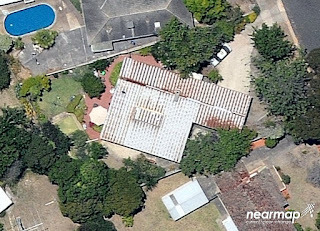 the straightening and patching is not shown, but the corrugated iron is reused on both roofs, keeping the rusty finish. The adjacent "squatters cottage" is less intact, but they recognise that they don't want to over-restore so as not to "loose the beautiful patina". "History lives in the timbers." The restoration requires more intervention - the entire building, except the sandstone chimney is dismantled, the parts are numbered, and new components made out of new and recycled timbers. Its taken a year, but the results would satisfy the most stringent heritage practitioner. Strangely enough we don't hear anything about the interfering bureaucrats or meddling heritage advisors. 455 Rosenthal Homestead Homestead Street Warwick L19 RP31031 The footprint of the building, including overhangs. The place is significant: - for its association with the local historical theme of land selection - for its historical association with the early settlement of the Darling Downs - for its scarcity value as rare surviving evidence of an 1840s pastoral homestead in Queensland -for its historical association with early Queensland land exploration as the assembly point for Leichardt’s last expedition. I presume they needed permits from the Council for the works. At least a demolition permit for the squatters cottage since it was completely removed for a while, but I can't find anything on their system. And no conflict with the council heritage expert. This was a mainstay of the first series. Perhaps council's have seen what happens and are keeping low. 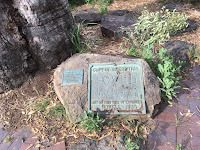 There was a 'Queensland Womens' Historical Association' plaque from 1962, commemorating the first licence to depasture on Rosenthall (with two ls) issued to Captain W C Mayne for the Aberdeen Company in 1843. didn't see this in the show - did the former residents take it with them? Chris makes the obvious, but unfortunately rarely adhered to maxim, that "There is a difference between restoring and replacing". His approach is far removed from the first three episodes of Restoration Australia, where the intrusion of style and commercial contractors compromised the conservation ethos too often. For Chris his life in carpentry gave him an intrinsic appreciation of the material - the fabric of heritage, and he was grateful to have "stumbled across something that's my calling." He was doing something he enjoyed, that made a lasting contribution not just to his own family, but to Australian Heritage, and there were no mother-in-law jokes. "The 1960s introduced us to shag rugs, lava lamps, minimalism and bright, open spaces. Melbourne couple Laura and Reece are leaving inner Melbourne for suburbia, with plans to restore a modernist home to its former glory." 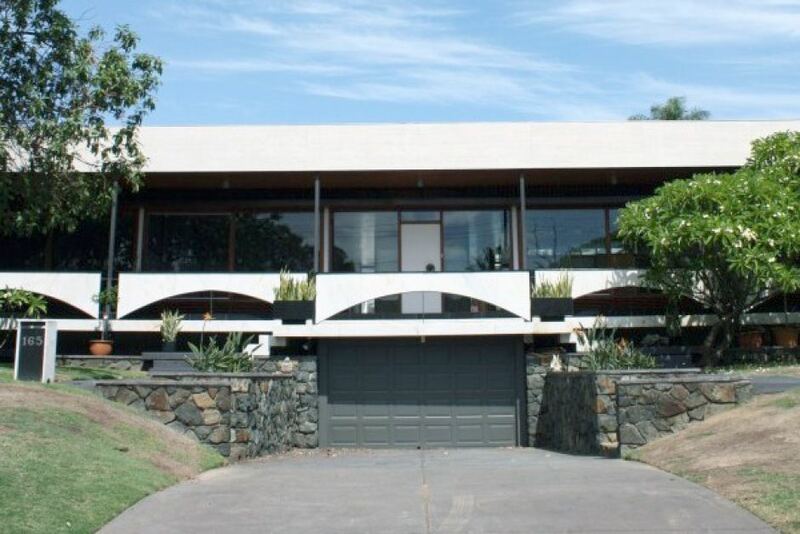 The 1960s house in South Frankston designed by Clarke Hopkins Clarke is subject to Episode 3. But again, restoration is a complete misnomer. It should really be called Demolition Australia. "While the Frankston House is in essence a restoration, it is not a restoration that returns the home to how it was originally built, rather it is a restoration that captures the inspiration that lay behind the first design." "To restore a building is not to maintain it, repair it or remake it: it is to re-establish it in a complete state which may never have existed at any given moment." It is certainly made into something that had never existed. But even Viollet recognised the primacy of the fabric: The "re-establishment" had to be scientifically documented with plans and photographs and archaeological records, which would guarantee exactness. The restoration had to involve not just the appearance of the monument, or the effect that it produced, but also its structure; it had to use the most efficient means to assure the long life of the building, including using more solid materials, used more wisely. It had to exclude any modification contrary to obvious evidence; but the structure could be adapted to conform to more modern or rational uses and practices, which meant alterations to the original plan; and it should preserve older modifications made to the building, with the exception of those which compromised its stability or its conservation, or those which gravely violated the value of its historical presence. This could just about be the Burra Charter, with more emphasis put on the reconstruction end of the scale. Little of the house is left intact. The interior walls are striped of their plaster, several are removed entirely, the ceilings are pulled out, the floor tiles lifted, the built in furniture is stripped, the unfortunate bluestone bar is demolished, the back wall is removed and re-positioned so they can push out the main bedroom to build an en suite, the roof is lifted, the pool is demolished, the garden is cleared out. Stuart Harrison remarks that it is "gutsy to not knock down a house that is not heritage listed. He makes it sound like demolishing the old and building a new McMansion is some form of enforced social obligation, rather than a demonstration of competitive status seeking. Laura feels sorry for the house - they've demolished half of it. So many of the original modernist features have been removed that Laura and Reece must turn to the interior decoration to recapture the Modernist inspiration - so they use some tiles like ones FLW used on some building in Japan. Sheesh what's wrong with Frank Walker. Some change might be justified in order to meet modern standards of construction, services and thermal insulation. Calling it a restoration though is dangerous. We are already in a period of relaxed versions of heritage protection. More buildings are facaded or gutted and only token heritage fabric retained. Developers push the envelope both in what then can remove, and what they can put in its place. So to present this sort of show as restoration gives the green light to all those other historic building owners that would like to turn them into open plan, double their size or make space for a big new development and not have to be bothered with fixing up some old bit of building. 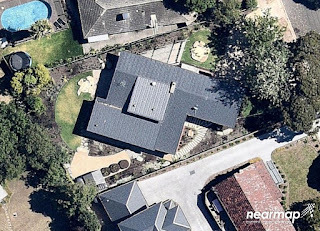 Restoration Australia Season 2 has fallen into the usual home renovation show cliches and stereotypes, where ripping out and replacing demonstrates your success. And it is about DRAMA! A roof beam is rotten! The pool is in the wrong place! Wikipedia lists about 116 home renovation TV series. Add one more. The show does have a thin layer of architectural history overlain over the home renovation template. We learn a bit about Modernism. It was optimistic apparently. and it is about light, and the outdoors, and clean lines, and honest materials. The Frankston house was designed by a firm closely involved in the Small Homes Service, a scheme to provide modern designs for houses in the economically constrained post war period of suburban expansion. Houses that addressed the suburban mode of living, improved living conditions with indoor toilets, shared living areas and less formal layouts, that made use of the positive aspects of the Australian environment - sun, air and the bush. Built for Jack Clarke's friend, Brian Gregory Gloury, (an engineer in the Commonwealth Department of Works and Housing and one time air force cadet and stalwart of the Frankston Cricket Club), the Ronald Ave house expresses the break with tradition both in its design, and position, turned as it is at a 45 degree skew on the block. The original design was apparently introduced as a slightly modified version of service plan V376, for "a split level home with a reduced floor area and only 3 bedrooms." The do-it-yourselfers from the first season appear to have been replace by cashed up hipsters and wealthy elites in the new one. While the owners are the main actors in front of the camera, the real work is being done by architects and professional building contractors. This renno cost around $600,000. 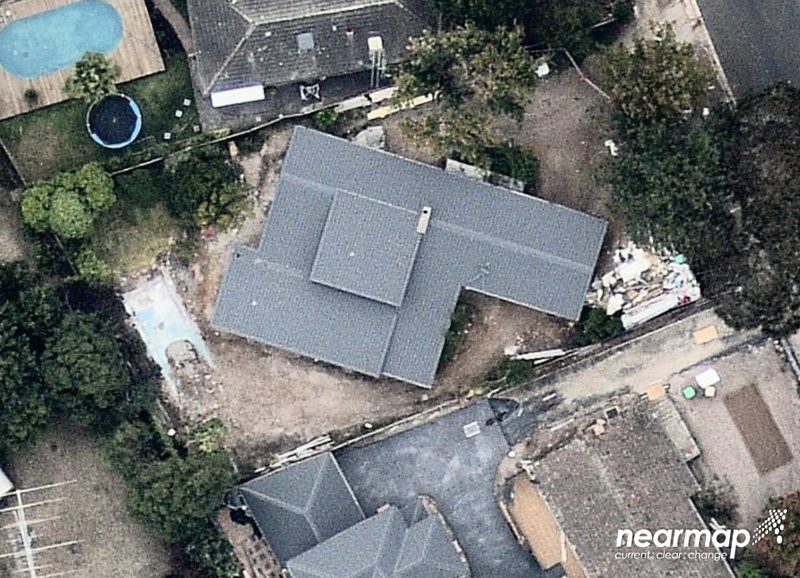 Houses in Frankston South sell for $700-900,000. The 'modest' Hunting Ground fixup was over a quarter of a million dollars. Paganin wasn't disclosed. Why they have changed from the budget conscious hands-on owner, to the well-paid contractors format, is unclear, except that the first season took a lot longer to make. The visits were spread out more, and the delays were more prominent. This might be why the new season seems to lack drama and pathos. If you have plenty of money, the issues and conflicts are more readily resolved. If you employ professionals, you also have their egos taking over, and their solutions tend to be more immediate. None of this waiting until you have time or money or can find the right materials at the price. And we don't even see the conflict between client and architect and contractor. If we did, it might make the series more entertaining. 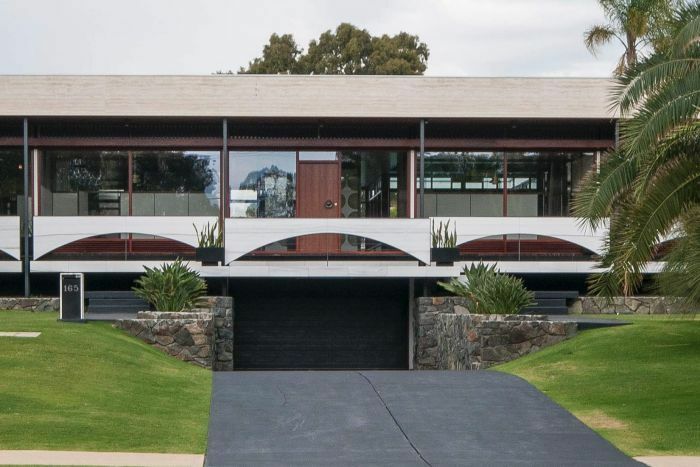 The Mid-Century Domestic Architecture facebook group has featured the house, and commenting about the Restoration Australia screening that some might find the extent of alterations and modifications confronting. The restoration is described as "Elective heritage work" making it sound like cosmetic surgery or a hip replacement. They want to reuse the bricks because you can't get them any more so the tradies spend ages chipping off mortar. Then they don't have enough then they find a perfect match. So they didn't really have to elect to use the old bricks. What we are left with are the renovation fetishes; fussing over what sort of tiles, or whether the bricks will exactly match, how much timber paneling is enough, the smoothness of the glass tiles in the bath, how the team "... re-imagines the home through the lens of Julius Shulman’s iconic images" to suggest Frankston is some sort of Palm Springs on the Bay. There is a focus on appearance rather than substance culminating in shots of ironic Warhol cardboard boxes for the move, an Eames chair artfully placed in a sunlit corner and the show's cast padding along the stepping stones in a Mon Oncle garden. Shame really. The Small Homes Service and modest mid century modernist homes offer salutary lessons about using simple but effective designs, relatively cheap mass-produced materials in innovative ways, and living in a more sustainable and environmentally healthy manner. Fetishising style becomes a neurosis. See them before the restorers restorer the life out of them. 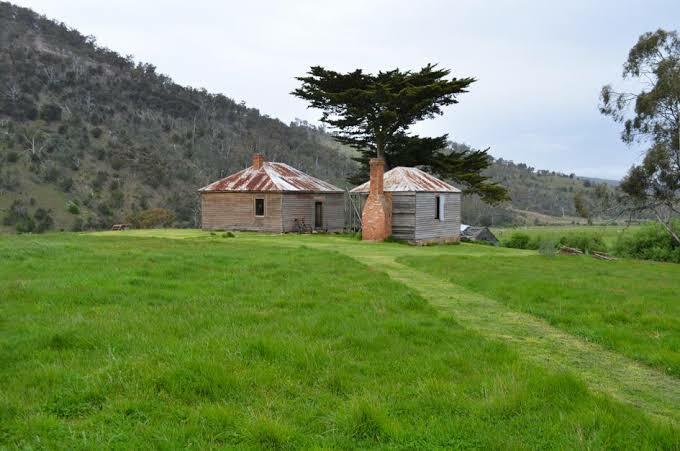 "Dale and Michael embark on a project to restore two 19th Century timber cottages on their Tasmanian rural property. Will they accomplish their dream?" Depends on what their dream is really. "Anthony Fenn Kemp, a thoroughly unpleasant and despotic soldier-merchant, who seems to have spent most of his life fighting with governors and trying to manipulate the political scene in both New South Wales and Van Diemen's Land"
"Dysart was formerly known as Shepton Montacute, just south of Green Ponds, now known as Kempton. Its current name is taken from estate Dysart Park in Kempton, which in turn takes its name from Dysart near Edinburgh"
"Circa 1826, "Clifton Vale" is a significant property steeped in history. Both the main house and the convict brick gaol that is reputed to have once housed bush ranger Martin Cash are heritage listed. Ancient Oak trees surround the house and garden and the front road boundary is lined with a Hawthorn hedge recreating the ambience of old England." The site contains several buildings, a timber and corrugated iron barn, a red brick 1850s chapel, and two timber buildings which are subject of the restoration. These appear to be late nineteenth, early twentieth century house and detached kitchen, with evidence of a former connection between them. They are in a bad way. Windows gone, a section of wall missing where the connecting room was demolished, and the usual decay resulting from abandonment. They also plan to be off- grid. Looks to me like they have no choice. Desert has no articulated sewer, gas, water, or NBN, and the nearest power pole is a couple of hundred metres away. Connection costs would be huge. The restoration focusses on windows and and a new bathroom. The house didn't have one before. There is also the new build to join the two structures back together. "Architect Christy Bryar designing a simple yet striking glass and steel addition that connects the two existing cottages [with an] 'invisible link'"
"retain their rustic feel, with original features, materials and weathered surfaces. Our vision was to keep it much the way we found it: well worn, with all the character and age that a 160+ year old property contains." I haven't heard that a bit of rust was a problem for tank water. The first flush digester that lets the dust and leaves flush off before any water goes in the tank would take care of a bit of rust. But they go with the Zincalum - one bit of character gone. Windows needed remaking and one of the gents thinks he can do it but he can't. Commercial windows are brought in. Not 12-pane double hung sashes but single sheet special double glazed casements - another bit of character gone. 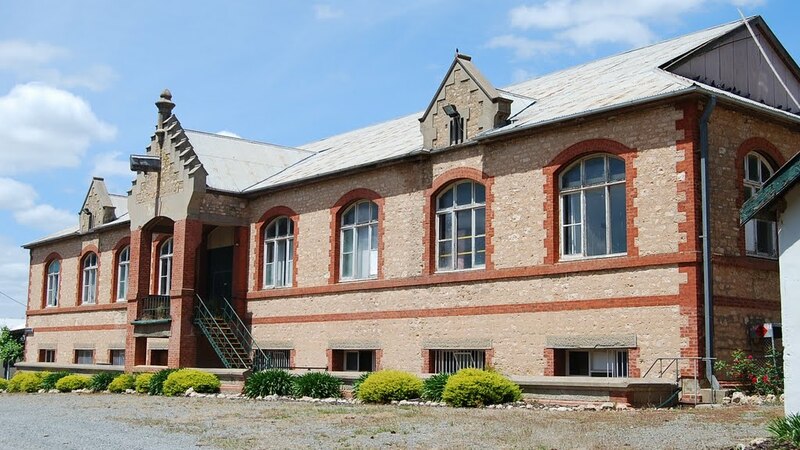 Southern Midlands Shire promotes the Centre of Heritage, which incorporates Heritage Building Solutions Services and Heritage Education and Skills Centre Services. It offers services for "the restoration and conservation of heritage buildings and sites for valued re-use". Wonder if they took advantage of this service? The cottage interior is all timber lined. This faded shabby chic aesthetic looks like it can be retained. We don't see how the modern services, plumbing, lighting, insulation and the like are fitted in, but two small elements are featured to make the point that the new and the old are melded. The joint between the steel framed glass wall of the new link and the weathered weatherboards of the old building is given its closeup and we marvel at how the straight line of the former sits against the zig zag of the latter. Except we don't get to see how it was done. Are the gaps filled with silicon or has someone cut neat triangular fillets to fill the gap? The other fill is needed in the gap between the chimney and the new glazing. About as much drama as we are likely to see. Then some bits of salvaged door frame serve the purpose and add some more rustic. Hunting Ground includes an 1850s brick Congregational Church, a left over from some early religious zeal and later subdivision and consolidation. This is given a much lighter conservation treatment - repair to the eroded bricks, replacing floorboards, like for like, and some reasonably innocuous new lighting. Some other lost buildings from the area hint that this was once a lively settlement. The cottage in the picture on the left was just south of The Gents place, but is now gone. Clifton Vale, the pioneer establishment, along with its convict built gaol that purportedly held Martin Cash, was recently sold for 3/4 of a million. The pioneers are presumably in the Clifton Vale Private Cemetery. Today Dysart/Hunting Ground is a quiet and sparsely populated rural area with only hints that 150 years ago it was a vibrant part of the Colonial experiment. The Gents are perhaps bringing some life back to the area as well as to the little timber cottage. 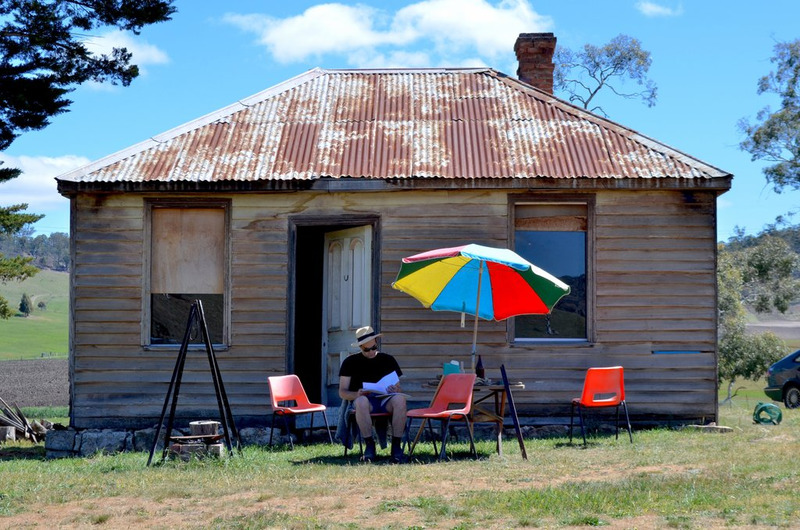 The ABC's 'Restoration Australia' has a second season. No longer hosted by interior designer Sibella Court, but now by architect and historian Stuart Harrison. It has taken a few years to make and has been contracted out by the ABC to Freemantle Media. The result is more renovation, interior decoration and bathroom fit-out and less restoration. The difference might seem semantic but is critical to the concept of heritage conservation. Returning a place to a known earlier state by removing accretions or by reassembling existing elements without the introduction of new material. Episode 1 looks at the Ivan Ivanov (or Iwan Iwanoff) designed Paganin house in Perth after a fire that left only the concrete slab and some perimeter walls intact. Ivanov was a Bulgarian-born architect who emigrated to Australia in 1950. his buildings seem quirky even for 1950s and 60s standards. Not pure modernist, but given a flair for a sort of eastern European kitschy love of unusual shapes, shiny materials and multiple textures. The inclusion of the destroyed house in this second series of Restoration Australia, where there is really nothing left to restore, might be the result of a personal choice. 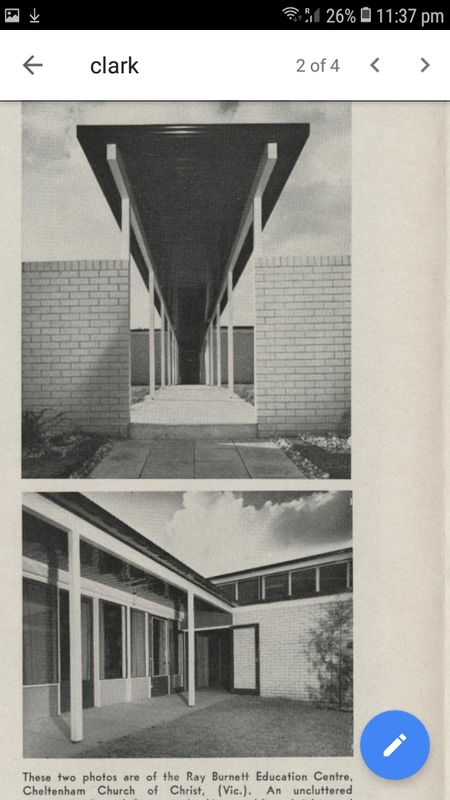 Harrison confesses: “I have a soft spot for the Paganin House, it was actually part of my introduction to architectural Modernism when I was studying architecture here in Perth...His creations were, both then and now, seminal examples of creativity and innovation". The Paganin house is described as 'a beacon of postwar design amid Perth’s suburban architecture', a 'classic example if Ivanov's 'late expressionist style', a 'brutalist masterpiece', 'one of the earliest examples of open planned interior design' and was noted for its 'heavy touches of marble, timber, laminate and stone'. While it is clearly not brutalist (being a steel frame clad in glass, metal and stone panels), and it doesn't seem to have been very well known before it burnt down in 2015, appearing only in specialist writings and the occasional obsessive website such as the house nerd, or the Perth 6000 blog, it now has become an 'Iconic Modern Masterpiece', and proof of the sophistication of mid century Australian home design innovation. I don't doubt all this is true, but the show's premise that it is about restoration of historic buildings or as they put it 'follows homeowners across the country as they restore forgotten heritage gems', needs a bit of tweaking to make this one fit in. Returning a place to a known earlier state and is distinguished from restoration by the introduction of new material. So Episode 1 is really 'Reconstruction Australia'. What is being restored then? The house is recreated for sure - and in all its shiny surfaces and timber paneling and screens the after shots look convincingly mid century modern. The idea that stands out in the show however, is that it is the restoration of the owner's belief in the house that matters, that the emotional attachment can be recovered and restored by rebuilding the place exactly as it was, as if this somehow wipes out the disaster that occurred. it makes me think of Dresden, and the reconstructions undertaken to somehow reduce the grief of loss that war, conflict and natural disasters cause. This is a reasonable idea, and one that is proper for heritage to consider. The conservation of cultural heritage is about maintaining and sometimes restoring a belief system, one that says the things from the past somehow make us what we are and maintain our sense of place in the world. Unfortunately little of this is articulated in the show as it fetishises the accurate recreation of what was lost. We see the metal brackets that supported the timber screens around the dining area, recovered from the fire and reused, becoming a reliquary of the martyred house, despite them being practically invisible and causing additional headaches for the tradies. An internal wall is reconstructed according to the plan (it is believed). "But something's wrong" the wall is 300mm out and has to be demolished and started again. The show is starting to sound more like The Block or even Bondi Rescue. The obsessive concerns for details continue - int the accuracy of the gaps between the timbers; In the worry about matching the Jarrah timber; Even in Ivanov's own house (which is visited to compare) where the books are arranged according to spine colour. Modernism is still on the rise. Facebook groups extol the glories of mid century modernist homes (mostly architect-designed), post-modernism and even brutalism. We might conclude that concepts of heritage have caught up and these styles can now be seen as part of an architectural history cannon, or they have aged sufficiently for feelings of nostalgia to develop. The contradictions in the pursuit of the new style, and the conservation of heritage, stand out in the show. The Modernist credo of stripping away decoration, of honesty in materials, is contradicted by the complicated and fiddly concrete blockwork, and the emphasis on shiny surfaces and expensive or difficult to manufacture or maintain materials. Ivanov's own house the polystyrene packing form concrete casting could well have been Italianate render moldings. but then most architectural theories are full of holes. The fact that a building, so far gone, can be brought back, and then considered still to be heritage, provides evidence for another way of looking at conservation of cultural heritage. My daughter suggested the Paganin house restorers could next take on the rebuilding of the Corkman Hotel. Aboriginal Scar trees are a diminishing archaeological resource. Those still in existence are generally more than 150 years old in Victoria. Continuing Aboriginal traditions of course, mean that culturally scarred or carved trees may still be created in traditional ways, but the record of the past, the trees that existed prior to the impact or invaders on the indigenous population, is rapidly being lost. There are a few mechanism's for this - both natural and human-induced. Land clearing, timber cutting, and increased burning were all brought about by the invaders, and probably accounts for the vast majority of scarred trees being removed. These impacts are continuing, either because of lack of knowledge about where the trees are or why they are worth keeping, or intentional damage by vandalism, illicit clearing, or racism-inspired acts. But there are also natural forces at work reducing the stock of surviving scarred trees. Scars are lost both because trees die, or because the continue to live. Despite some Eucalypts being very long lived, many are senescent in a couple of hundred years. In 400-500 years, it might be assumed that natures elements - of disease, decay, storm damage, natural fire, insect and animal damage, and just old age, will result in trees dying. Even dead a scar tree can stay in the landscape for another hundred years of more, but it will not last forever. Even the cases where tree surgery and preservation techniques are used to extend its life, the scar will still be lost. 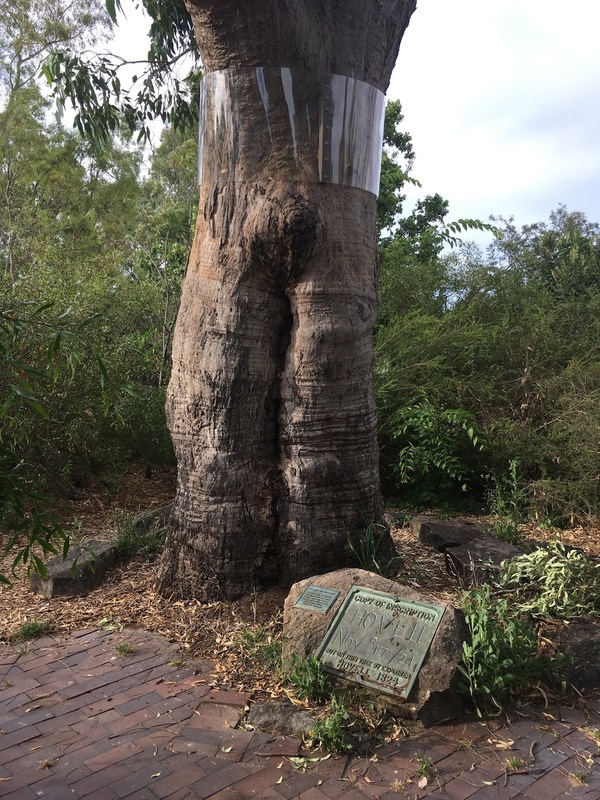 The stump in the Fitzroy Gardens is a case in point - gradually loosing height and volume and sinking into the ground, despite various treatments. In instances where the tree continues to live and is healthy, in most cases, the bark around the scar will continue to grow, gradually thickening and growing out and into the void where the earlier bark had been removed. Eventually, the two sides of the overgrowth bark will meet together and combine, leaving only a faint vertical line and some additional creasing in the bark around it to signify where the scar had been. 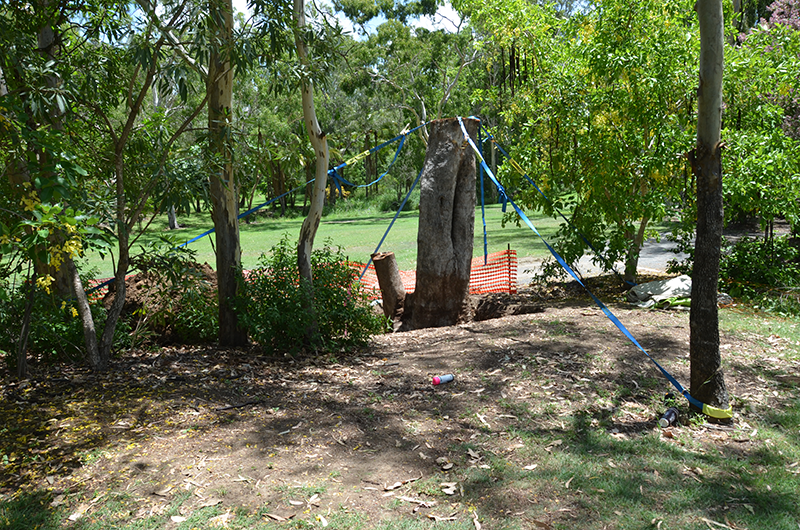 Here is a scar tree supposedly saved when it was relocated from Stanwell to Rockhampton Cultural Centre in Queensland. How long does this process take? Probably not that long. A good measure is the scar tree cut on 17 November 1824, not by an aborigine, but by William Hovell, now 192 years old. In that time the scar has almost entirely sealed over, and the heartwood of the tree in which the inscription was cut, has rotted away completely. Another few decades and if the tree stays healthy, there will be only the faintest trace of where the scar once was. So why does this matter? In another 100 years it is likely that the only scar trees left will be those in museum's or heavily restored and conserved. Natural forces will ultimately take all the rest. It is therefore imperative that some consideration is given to what is done in the mean time. 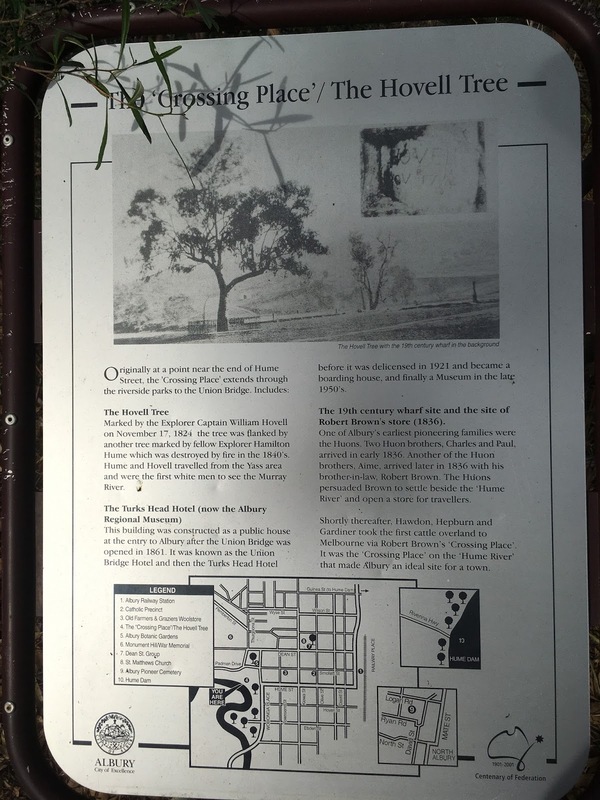 Yesterday's The Age article shows an example of well preserved scar trees at Boort, that the local Aboriginal community consider a major part of their culture and heritage. They are, however, preserved in their present dead state,because the lake was artificially flooded as part of an irrigation scheme, which killed the trees and prevented further overgrowth of bark. As they were also in a protected piece of public land, and there was no demand for their timber until, sitting as it is in permanent water, it became commercially valueless, they did not get cut down or burnt. At least a program to identify and record them, and monitor their condition (not just the Boort trees, but all the surviving scar trees in the country) would at least let us know what we are going to lose.